Double the 4G data. Reduced price. Sounds pretty good, right? Virgin Mobile is not afraid to unleash a phenomenal bargain. Just a few weeks after the mobile carrier served-up a whopping 120GB of monthly data, it has unveiled an unbeatable new cheap SIM-only deal that will save you a chunk of change – without sacrificing your 4G mobile data allowance. For its latest deal, Virgin Mobile has doubled the mobile data available on one of its most affordable SIM-only deals – from 2GB of 4G data, up to 4GB a month. This generous helping of data is coupled with unlimited text messages and 1500 minutes. The SIM-only plan costs just £8. That makes it by far the cheapest price we've seen for that amount of mobile data on any SIM-only deal currently available on the market. Under normal usage, 4GB of data should be more than enough to stream the latest album on Spotify, watch that YouTube clip that everyone is talking about, send WhatsApp voice messages with friends, and even a few FaceTime calls. Virgin Mobile also offers the ability to rollover any unused 4G onto next month, so any leftovers at the end of a month spent predominantly on Wi-Fi will not go to waste. If you're looking for a well-rounded SIM-only deal that doesn't break the bank each month – this is it. Virgin Mobile has doubled the amount of 4G mobile data usually available with this bundle and dropped the monthly cost from £9 to £8. You'll also get unlimited texts, a generous 1500 minutes and access to 3.5 million public Wi-Fi hotspots around the UK. Bargain. As you'd expect, you'll benefit from all the usual perks of a Virgin Mobile contract, including unlimited access to Virgin Media's network of 3.5 million public Wi-Fi hotspots around the UK. This includes access to the London Underground network. If you want to take advantage of the latest offer, you should act fast. 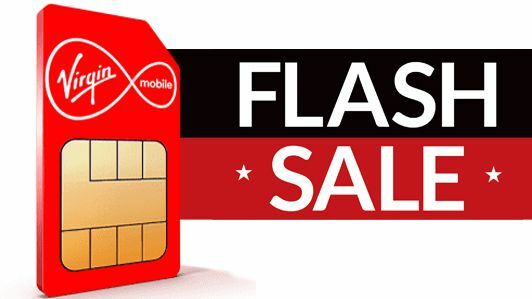 Virgin Mobile has included the double-data SIM-only plan as part of its latest Flash Sale. The offer ends on February 18, 2019 so make sure you're signed, sealed and delivered by then. If you don't fancy signing up to Virgin Mobile, then why not check the other options available in the comparison chart below?